Wire parts, commonly referred to as wire forms, are formed from wire that has been manipulated in some fashion into a specific shape or design. After the wire has been formed from raw materials, it is then further fabricated to create various wire parts. Useful in a broad range of applications, wire parts are beneficial for many industries because of their durability and conductivity as well as their versatility. 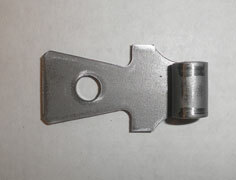 Some of the many applications of wire parts include: wire grids, racks, POP displays and shelving, which are commonly used in retail, commercial and residential industries; wire light guards, DIN rails, wireways and cable trays, which are often utilized in the electronics industry; wire brackets, busbars and gratings that are used in construction and architectural industries; and wire motor mounts, machine guards, wire baskets and screens, for the industrial manufacturing industry. Also useful in the automotive and aerospace industries, additional wire parts include grilles, coils, clips, hooks, rings, fasteners, hangers and springs. In addition to the many shapes and designs, wire parts can be made with a wide range of materials, chosen for their suitability in certain applications. Commonly made from steel or stainless steel, both metals suitable for corrosive environment, wire parts can also be made from plastics, aluminum, brass, copper and various metal alloys. In accordance with the vast range of wire parts, there are numerous wire forming processes used to create them. Some of the more common wire forming processes include metal stamping, roll forming, CNC wire forming, weaving and welding. Metal stamping processes involve using a stamping press to form flat metal wire into precisely shaped metal parts. Popular metal stamping processes for wire forming include deep drawing, short run and fourslide. Roll forming is another major wire forming process, able to create flat, round and shaped wire parts. 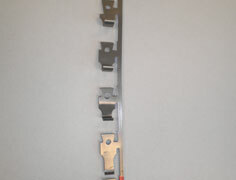 A continuous process, roll forming uses calenders and die punches to shape metal wire into various forms. CNC wire forming processes utilize computer controls in order to ensure a higher level of precision than with other processes; thus, CNC wire forming can include other wire forming processes such as bending or welding but are altered due to the addition of CNC capabilities. Weaving processes are simply methods of interlacing various threads into a pattern similar to a cloth, or on a larger scale with gaps such as a grid. Lastly, wire welding can refer to various processes, the most common of which are MIG welding or TIG welding. TIG welding is the most accurate type of wire welding, however it is much more complex and requires a very skilled operator as well as longer production times, so MIG welding is often used instead.